Is Newcastle's Castle Keep really haunted? 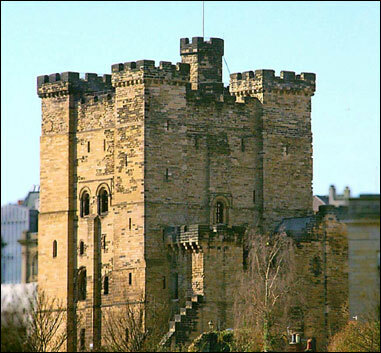 The original Castle Keep in Newcastle was constructed using motte & bailey, until it was replaced with a stone built structure in the 12th century. During this time both a Roman settlement and an 8th century cemetery were disturbed whilst the foundations were laid - and part of the Roman settlement still exists under the castle to this day. With the amount of history that's taken place within its walls, you'd expect a fair few ghost stories here. One of the most recent stories comes from a man who was visiting. He was ascending a flight of stone stairs near the mezzanine chamber, when he physically bumped into someone on the stairs. Turning back to apologize, he realized no one was there... Suffice to say he left the building soon after! In the Great Hall, many people have claimed to have seen a teenage girl in pre-Victorian - probably Edwardian - style of dress moving quickly around the room. Also, in the Galleries that overlook the Great Hall, eye-witnessed have seen a woman in her mid-twenties, with Elizabethan dress and even heard the rustling of her gown. It's often reported that the Mezzanine Chamber is the most terrifying room in the building. People complain of oppressive nausea and ghostly whispers. The Mezzanine Chamber was in fact a holding cell for people to be taken away an executed, so it's hardly surprising that this phenomena is reported, given the amount of emotional torment that's taken place within the room.